1 Million for Work Flexibility has more than 60 organizations on board to date as part of our coalition—and counting. We’re excited to launch our new “Spotlight On…” series with today’s post about supporter Boston College Center for Work & Family. 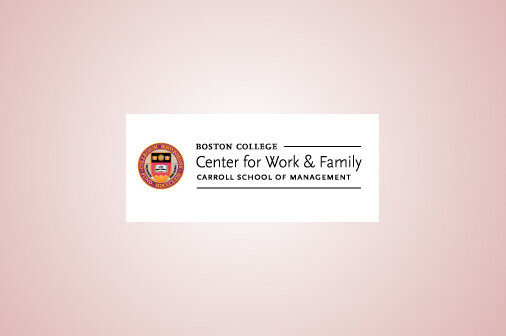 The Boston College Center for Work & Family understands that work life and family life are not mutually exclusive. Founded in 1990, the Center strives to foster harmony among employees, their families, and the companies that they work for. The research supported by the Center focuses on workplace flexibility, work-life integration, career development, diversity, corporate culture, and more. The Center has two primary goals. First, the Center seeks to bring together thought leaders from both the academic world as well as those in the corporate world. By uniting the two groups, the idea is to generate conversations and discussions on how to better improve work life integration as well as productivity. The Center has nearly 100 corporate partners which represent over 4 million employees. Second, the Center realizes that in order for positive workplace change to occur, it’s critical to ensure that the way in which work is perceived changes as well. Senior leaders and bosses must establish a culture that supports work-life integration for their employees. Human resource departments should proactively address issues related to work-life and develop policies within the organization to help employees thrive in both their professional and personal lives. Finally, employees themselves must have an active role in their own work-life fit, as well, by proactively managing their careers. As Executive Director for the Center and professor in the Carroll School of Management, Dr. Brad Harrington leads the charge on the subject of career management and work-life integration. While some people may view work-life balance as a working mother’s issue, Dr. Harrington’s research into how fathers balance work life and family life is substantial. He is the lead author of The New Dad: Exploring Fathers in a Career Context and The New Dad: Caring, Committed and Conflicted, which explore how fathers manage (or struggle to manage) their careers and their parental duties. In addition to its vast research, the Center offers executive education workshops as well as custom programs and engagements to help organizations implement workplace flexibility. There is also a wealth of information on their website for employees on topics like Career Management, Child & Elder Care, Parenting; Health & Wellness, and Flexible Working. 1 Million for Work Flexibility is proud to have the Center’s support as we work to expand access to work flexibility for employees across the country. For a full list of our supporter organizations, visit our Who We Are page.